Today I bought the Times as there were no Guardians left at the shop. I don’t buy printed newspapers much as they are mostly full of useless information that’s poorly spell checked and too dominated by celebrities. Green nail polish from Chanel is selling for £80 on ebay. This was on the front page, seriously. 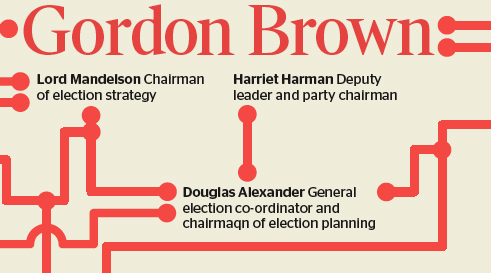 Gordon Brown has a network of helpers including someone who is a chairmaqn – I didn’t know that word had a silent Q, but there you go (page 32). EDITOR: Can you quickly do a graphic to tart up this story? VISUAL JOURNALIST: What’s the story about? E: Not really sure, they haven’t finished writing it yet. But does it really matter? Just put all these names in it and then link them together somehow. E: Why does it matter? Graphics are just there to make the page look pretty. In my previous career as an editorial design consultant I often saw how underrated visual journalists are in newsrooms (other than at the New York Times where I have heard that there are around 22 of them). Their skills are often seen as secondary to that of word journalists and they are not given anywhere near enough time and resources to properly craft their graphics. Good infographics take time to create. Good infographics explain and offer insight. They can support the story, or they can stand-alone. They should make sense, or they should not be used. They are journalism, not decoration. The Times needs to do better. Lest you think I am being one-sided, there are many visual journalists out there who do not deserve the title. Just because someone is good at using Illustrator doesn’t mean they can tell a story visually. If you are wondering what the good bits were from the Times today they were the story about a Royal Commission report that recommends traffic lights be switched off to save energy and stop light pollution (page 36), and a story about how the charity Fine Cell Work teaches needlework to prison inmates so that they can learn new skills and earn an income to help support them when they get out of gaol (page 40).